Boccara is renowned for its textile art and fine art collections. 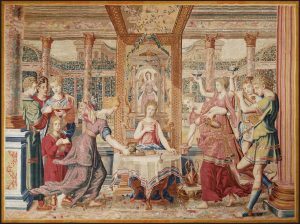 It has one of the most important collections of antique tapestries from the French Royal Manufactories ranging from the 16th – 19th century with Royal provenance; as well as rare signed modern tapestries of the greatest artists of our time, such as Sonia Delaunay, Vassily Kandinsky, Alexander Calder and Victor Vasarely. Fine Art is the latest department of Boccara, presenting artworks from significant modern and contemporary artists, including Damien Hirst, Wang Keping, Jean Miotte, Léon Zack, André Lanskoy, Gianfranco Meggiato, Benjamin Shine, Monique Rozanès and JonOne.